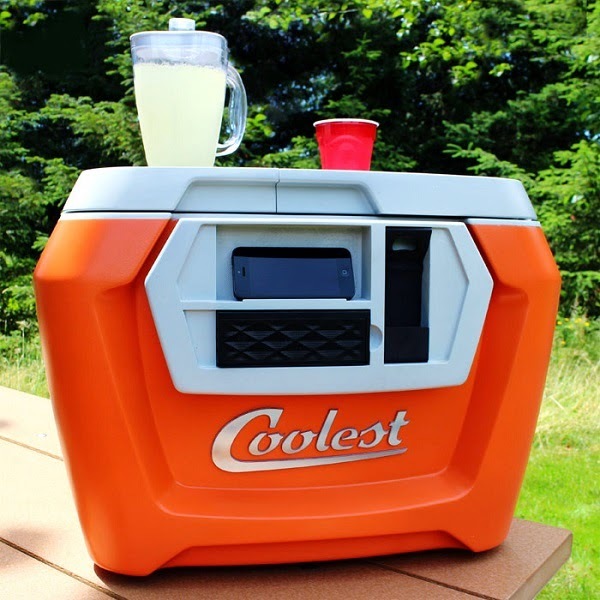 Who would have thought a seemingly simple Cooler (or Esky to us Aussies) would raise over $13 million (USD) in funding, garner the attention of over 60,000 contributors, millions of onlookers, and cause industrial designers and backyard inventors alike to start salivating at the thought of achieving such success? The Coolest is the Brainchild of Ryan Grepper, a serial inventor who ran a campaign through the popular crowd funding website, Kickstarter. The Coolest features a blender for mixing cocktails, a water proof bluetooth speaker (looks to be a Jawbone Jambox), USB charging output, plus many more clever additions that help it stand out in a seemingly simple and rather boring market. Kickstarter, for those unaware, is a global crowd funding website for projects- which include consumer products, films, music, stage shows, comics, journalism, video games, and food-related projects. Everyday people can develop a campaign based on their project, and other everyday people can pledge money towards it in an effort to see it funded. Each pledge is rewarded depending on the amount, whether it be a limited edition t-shirt or receiving one of the first products off the assembly line. It is a great opportunity for people with great ideas but limited cash flow to see there projects come to life. Amazingly, this isn't the first time Grepper has tried to fund the Coolest, running an unsuccessful campaign late 2013. With his confidence low, Grepper went back to the drawing board and re-jigged the design, gathered more supporters, adjusted the date of the campaign (July instead of November), and set the funding goal lower- from $125,000 down to just $50,000. Withing 36 hours of beginning the second campaign, that $50,000 goal was smashed, and people kept contributing right until the end- with over $2 million raised in the final 24 hours. The final figure was $13,285,226 from a total of 62,642 backers, and now Grepper has the arduous task of finalizing the design and sourcing manufacturers. Even more amazingly, is that this record is predicted to be broken before too long. Kickstarter has seen incredible growth since its founding in April 2009- at the height of the GFC- and has proved itself as a viable alternative to the more traditonal funding avenues that faltered during that period- banks, investors and venture capitalists. Last year, donors funded an average of $1.3 million (USD) per day, and as of last quarter funded an average of three projects each hour- with a dozen of those breaking the $1 million mark. This is promising news for those of us with an idea we want to see come alive- whether you are a Director of a small startup, backyard inventor or a group of mates who have had that lightbulb moment. However, despite its instant appeal, you don't read much about the unsuccessful campaigns- which there are many. There are a few factors that can contribute to an unsuccessful campaign- poor idea, poor design, poor marketing, poor timing, limited target demographic or perhaps an existing similar product on the market. Engaging an Industrial Designer at the beginning is a crucial make or break step, and can help to eliminate the above factors. Industrial Designers can help grow an idea into a product that appeals to the masses, and then develop it into a visual or functioning prototype- something that Kickstarter requires of all Product Design campaigns. Once funded, Industrial Designers will help to further develop the product to a mass production stage and help source local or international suppliers and manufacturers. Additionally, a great product that no one knows about is also not going to achieve success. Kickstarter features thousands of different projects, so spreading the word is crucial to stand out. Campaign runners need to find the right marketing avenues be it blogs, local newspapers, friends or family. Finding your key demographic and targeting them is another aspect of the campaign in which an Industrial Design firm can greatly help. Simply relying on the exposure of being on Kickstarter will most likely lead to one thing- getting lost in the crowd. Whilst it should be in no means considered easy money, crowd funding certainly has its benefits. With 21 years experience, Charlwood Design can guide you and help you achieve the most out of your idea and turn it into reality. Now all you need is that $13 million dollar idea!